Sign-up for my newsletter for authors! 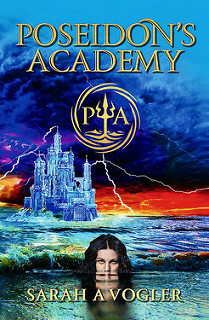 I am organizing a review opportunity for Poseidon’s Academy by Sarah A Vogler. This review opportunity is now closed. Review copies of this book are available in e-formats. There is no deadline before when you have to review this one. Getting sucked into a whirlpool, sleeping in monster-infested woods, and battling psycho sea-nymphs was not how Hailey planned to spend her first year of high school. But when you’re the only Zeus in the world, life tends to get a bit complicated. The Great Battle saw the world changed forever when humans killed the gods and absorbed their powers. One power was coveted above all others: Zeus’s. Thirteen-year-old Hailey Woods is the first Zeus in over a century. Unlike everyone else, she hates her powers because of an ancient prophecy that claims a Zeus will have to save the world someday. Hailey doesn’t want to save the world. She wants to be a normal teenager, whose biggest dilemma in life is deciding what to eat for lunch, rather than training to become the ultimate weapon. Poseidon’s Academy, an underwater palace where her powers don’t work, was meant to give her that opportunity. But when she arrives, she discovers the sea-nymphs living there are plotting to resurrect the gods, and Hailey must find a way to stop them before they can enact the prophecy. Sarah A Vogler was born in Brisbane, Australia, where she spent her childhood climbing trees, wrestling her three brothers, and watching Xena: The Warrior Princess and Hercules: The Legendary Journeys. It was these two TV shows that sparked Sarah’s interest in Greek mythology and saw her spend entire days sitting by her bedroom window, waiting for a pegasus to swoop out of the sky and take her on an adventure worthy of Homer. When it was clear a pegasus wasn’t going to rescue her from her dull life, Sarah turned to writing her own adventures. 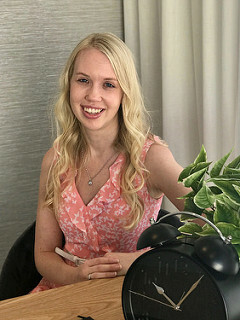 Sarah combined her love of Greek mythology with her love of writing and went on to study a Bachelor of Arts at The University of Queensland, with majors in Ancient History and Writing, followed by a Master of Arts in Writing, Editing, and Publishing. After graduating, Sarah became a freelance editor and spent her spare time working on her novels and submitting them to agents and publishers. She received dozens of rejection emails but persevered, knowing nothing worth having comes easy. Hello! Thanks for visiting my site! I am Lola. Here at Lola's Blog Tours I organize blog tours for fiction books. Interested in booking a tour? Want to become a tour host? Enter your email address to receive notifications about new tours. See all the open review opportunities here.